The first time it happened to me I was sitting on a bench outside of my Israel apartment in late March last year. It was night and I was studying my microbiology flashcards by streetlight. It was a better environment than my cramped bedroom. Looking back, I think moments like that should have some special quality to them. Like, I could feel something was just … off. It’s quiet … too quiet. Look up and see something ominous, like a raven. But there was none of that. It was a completely normal evening. The occasional car drove by with techno music blasting too loud. The fruit and vegetable stand at one end of the street was busy, and at the other end of the street there was a bored line of people at the bakery. And then there was a siren. 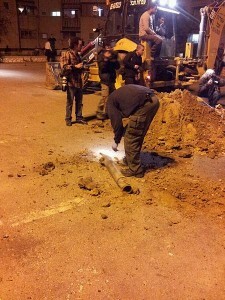 A rocket fired from Gaza hit Netivot last March, injuring one civilian. I looked to either end of the street. Despite the siren filling up the night around them, the line at the bakery was just as bored as before. I could still see old ladies picking over onions at the vegetable stand. No one was acting as if anything was happening. So I thought nothing was happening. Probably some military thing that’s routine, I thought. I sat back down and let the siren keep blaring. It wound down after going off for about two minutes. Everything was as quiet as before. One of my roommates appeared and asked what the siren was about. Neither of us had answers. There was no echo, no secondary explosions … just a hollow sounding massive “boom.” And still no one was acting as if anything was wrong, except for me and my roommate. He looked at me with wide eyes. “That sounded legit,” he said. There was still no way to know what was happening. Even if we had radios, we couldn’t understand anything coming over the wire. We’d been told by administrators at our school that there’d been unpleasantness in years past, but we were never told what to do if we heard sirens and explosions. And, Be’er Sheva is near an army base, so the sound of explosions is something that is part of the aural landscape of where we live. Beer Sheva in peaceful times. I called one of my classmates who’d been living in Israel for a few years before medical school. All I remember him saying to me is that I should get to a bomb shelter if I heard the siren again. He confirmed our wondering: that was, indeed, legit. Our local bomb shelter was locked and we had no idea how to find out who it was that had the keys. The stairwell was our alternate location. We went inside and soon the emails started to fly. We found out the explosion we heard was a shot from Gaza. Palestinian terrorists fired more than 200 rockets at Israel. Many rockets struck major Israeli population centers, such as Ashdod (pop. 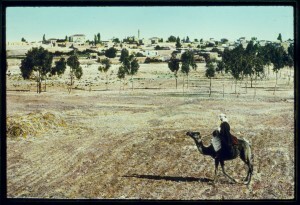 200,000), Beersheba (pop. 190,000), Ashkelon (pop. 110,000) and Netivot (pop. 27,000), according to the Israel Defense Forces. More than 1 million Israelis live under the threat of rocket attacks from the Hamas-controlled Gaza Strip. The siren would go off for almost two minutes. When it stopped, we had something like 40 seconds until the rocket hit. All information that would have been useful to have been told before the moment I was standing out in the open wondering if it was all just some exercise I didn’t know about. And as the night wound down I wondered, “What exactly is happening?” Was something happening? Was there a war breaking out? Or was this just the condition of this place? All I could gather from the Internet was that the Israel Defense Force (IDF) killed some people suspected of terrorism in Gaza. That made Hamas angry, so they started shooting rockets. No, war was not breaking out. Apparently this was just part of living in this place. That’s why no one outside seemed concerned. They’d heard it before, and, anyway, they needed to get some onions before it got too late. I remember that being something I kept thinking about that night: why was everyone so clam. Surely they knew what was happening. Surely one does not make the decision lightly to keep standing in line for cinnamon rolls when one knows a rocket is heading for your city. Ok, I admit to all those munitions experts out there, you could have a lot worse than a Grad rocket shot at your city. But whether it’s a grenade or an ICBM, when you’re part of the target area the fact that one kills harder than the other doesn’t make much difference. I couldn’t figure out what would keep you considering this head of lettuce over that one if you understood what was happening. At the time, I decided to recognize it as something I already knew about the locals: these are tough people in a tough place. No need to worry anyone needlessly, I thought. As I laid in bed that night the neighborhood was quiet. I could hear distant thunder. Rolling. Rolling. I love the sound of thunder. Everywhere I’ve lived, I’ve never heard thunder like I’ve heard back home. And I’ve always missed its roar in the storms of other places. But this was the desert, and there was no rain. This was not thunder. It was the sound of IDF artillery showering Gaza. I prayed for all of us. And it rolled until I drifted off to sleep.